OKC.NET | Adoption of the Week: Meet Mamacita and Pups! Adoption of the Week: Meet Mamacita and Pups! Do you need a puppy fix? This is the article you’ve been looking for. I know Rebecca Bean from when we’d volunteered at one of the Norman Music Festivals together a few years ago, and because she is one of the owners of STASH. 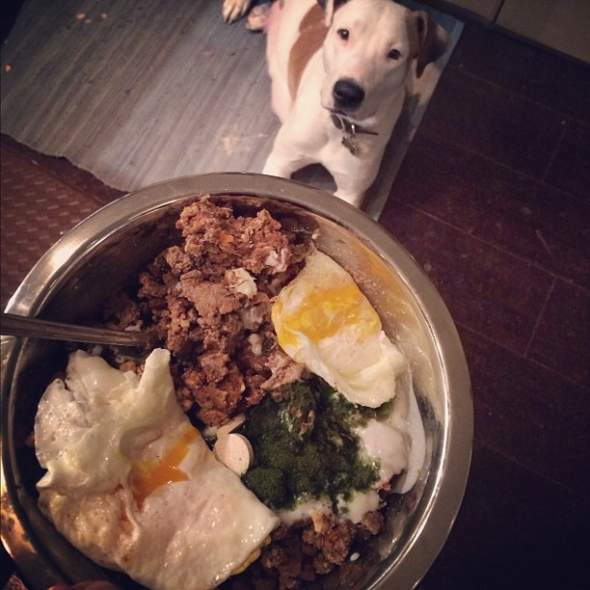 And if you’ve been following STASH’s Instagram account, then you know some of this story. But if not, get a tissue. Or even if you do know some of this story, you’re still going to need something for those misty-eyes, because *all the feels* are going to get to you. 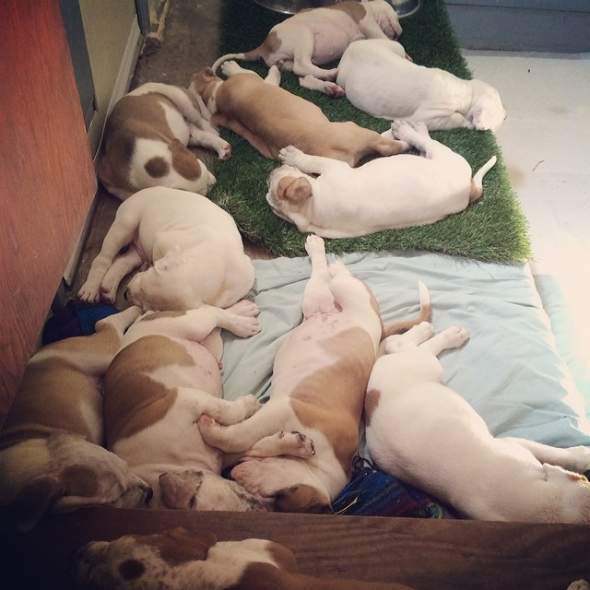 If you’re ready, let’s dig into this story of community, volunteerism, and puppies! Photo by Rusin Sparks, Oklahoma The Way I See It. OKC.NET: How did you find out about Mamacita? Bean: I’m friends with Friends of the Animals of Norman and Mamacita came up on my Facebook news feed one very cold weekend. It was a three day weekend, so it was likely that momma would give birth alone, in a tiny, cold, and dirty cell. Animal control officers would only be there to feed. If she had any complications during birth (which she did) she would have them alone, and could perish without anyone knowing until the next day. Instead, she ended up choosing the only carpeted room in our whole house to give birth. Thank god Lauren Lackey stepped up to help with the birth, and beyond. Having one dedicated person outside of my husband and I has been a huge gift. It’s been the only way we could escape for a date or whatever. It takes a village, and we have an incredible one. OKC.NET: What compelled you to foster her? Bean: Her face. Those eyes. I’ve been feeling a desire to ‘give back’ for a while. Who more worthy than those with no voice? 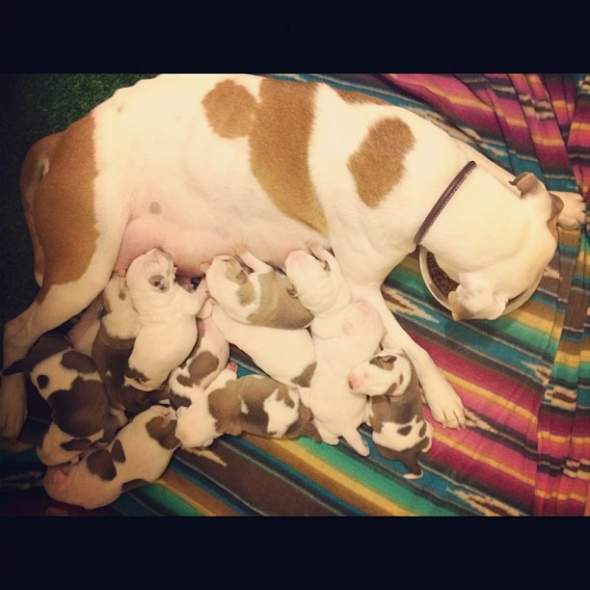 OKC.NET: Have you ever fostered a dog before, or for that matter a pregnant one? In college, I volunteered at a shelter near where I lived in San Diego. I’ve helped transport dogs from kill shelters to rescues in other states, and our current dog started out as a foster, but no, never a pregnant Momma dog. I’ve been around puppies being born though, so I wasn’t totally unaware of what to expect. I was so grateful that I could call Dr. Harrington from All Pets at 2:30 a.m. to ask questions when things got scary. 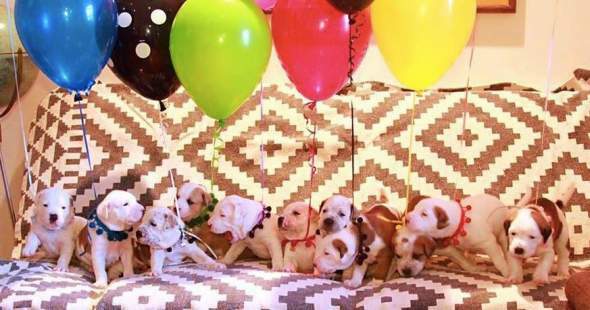 One baby was born without a placenta, and there were numerous times when I thought she would be done… then one more puppy… then two more… 13 hours later, we had 11 healthy puppies. OKC.NET: I know there have been issues where people have adopted shelter pets who then had health issues (mostly because they take in all animals and can’t stop the spread of everything). 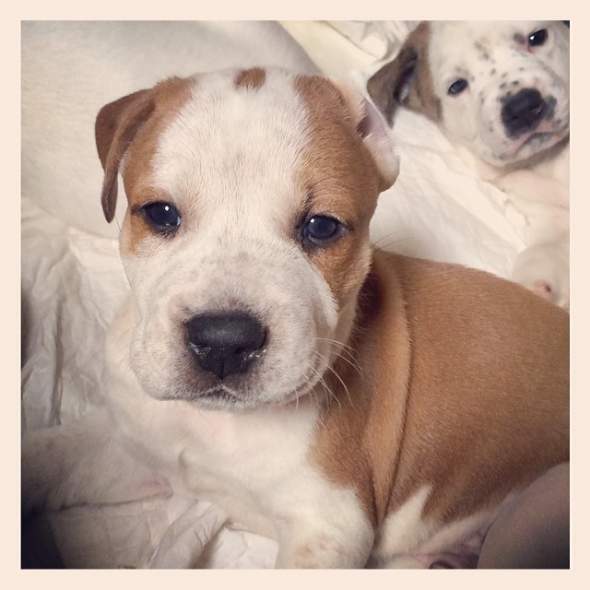 Are all the puppies and Mamacita current on their shots and what medical care will they have had by adoption time? Bean: Any animal, like any human, can have health issues. I’ve seen many more cases of sick, inbred, unstable, and unhealthy animals that have come from backyard breeders and puppy mills than I have from shelters. At least in shelters, the humans involved have a level of ethical standards and a baseline of knowledge. The same can’t be said of people who do this for a quick profit. Of course, having a pet is a responsibility, and like with a child, anything is possible. One of the upsides of having a mutt is that they have a lower chance of inherited congenital diseases. 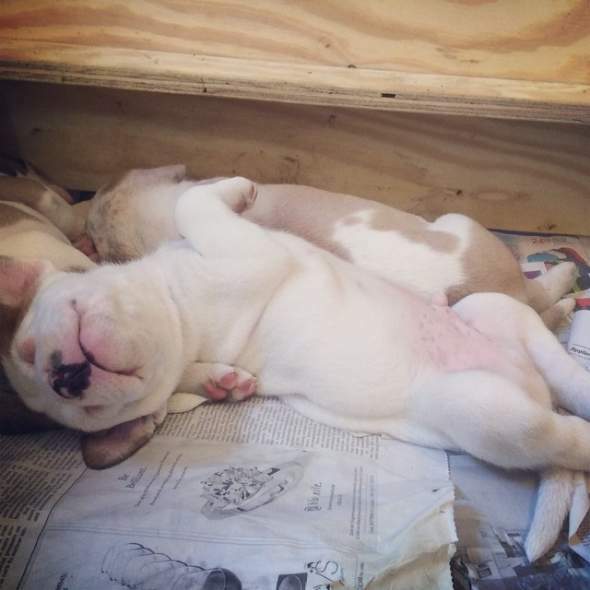 So these little guys, like most rescue dogs, are the epitome of health. They are strong, smart, sweet, willing learners, and very people-focused. From Rebecca’s STASH Instagram, this is her friend Lauren Lackey. One of a few helpers. 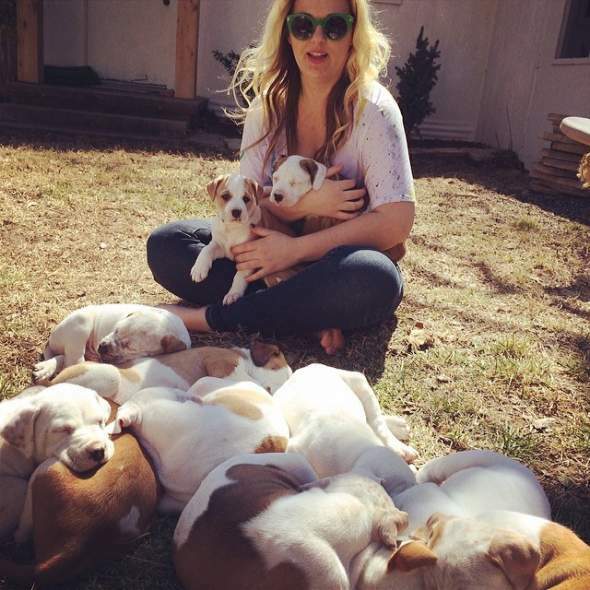 OKC.NET: How much has come out of your own pocket to save these guys from euthanasia? Bean: Well, this litter was huge – 11 were born and all survived. So it’s kind of like we had 2 average sized litters. I’m sure it could be done for less, but we took momma dog to our private vet, and have taken all the puppies there as well, rather than rely on the animal shelter for shots, etc. The most expensive things though have been puppy formula and puppy pads. I’m a neat freak so those puppy pads at 50 cents a piece really added up. Momma was underweight when she was pregnant, which put her at risk for calcium deficiency while nursing a large litter. Calcium deficiencies can lead to seizures. To avoid that, we bottle fed all 11 puppies around the clock. We were spending $30-50 in formula a day. That and the puppy pads and premium were the most expensive parts. It will be more than that by the time we’re done. I know that sounds crazy, but momma was severely under weight, so we went the extra mile with supplemental feedings of “satin balls,” which is raw beef meatballs mixed with molasses, supplements, and organic local eggs etc, and premium food, medicine, vet care, etc. It’s amazing how quickly organic fresh wipes, toys, and $60 bags of puppy food can add up. But money alone couldn’t have ensured that these guys would be doing as well as they are. I think that the love and sheer amount of time spent has been the most crucial. We were dedicated to doing whatever we could to ensure their health and wellness. That kind of dedication is possible no matter how much money you have (or don’t). I think with the help of a local rescue, any dedicated family could take this on. The only thing that has exceeded our dedication though has been the love and gratitude we’ve received in return. Momma dog certainly watches, and seems to appreciate our care of her little ones. She, like all rescue dogs, has a unique portion of gratitude. I saw a cartoon recently that showed a man in a lazy boy chair with a dog laying next to him. The man is thinking, “I wonder what it feels like to win the lottery?” The dog is thinking, “A lot like being a dog rescued from a shelter, I bet.” For us, we feel like we’ve been the ones who have won. The pure love that emanates from these little ones who are so dependent is thanks enough. OKC.NET: Have rescue organizations or anyone else helped in the effort? Bean: We’ve had offers from local rescues like the Bella Foundation and others to help shoulder the burden. We felt like if we could take care of these guys on our own, that those funds could be used to help more animals. Our main request is that people help us get the word out about adopting these guys. The highest help that we’ve received has been in the form of encouragement, prayers, well-wishes, and volunteers who have sustained us in every way. Because momma dog was so overly-protective, it’s been on my husband and I and just two other people to maintain this litter over the last 6 weeks. If momma had been a healthy weight, it would have relieved our burden quite a bit. It’s been a truly community effort, and the kindness that we’ve received has humbled and sustained us. OKC.NET: How has Instagram and other social media impacted your choice to foster and have you seen it inspire others? Bean: This has been the true surprise in all this. I knew that there were at least a few animal lovers and family and friends out there who would enjoy the story, but we’ve been amazed at the extent of the reach. People from all over have shared in the stresses and joys of this journey. We’ve felt a network of people, many of who we will never meet, loving and supporting these sweet little orphans. OKC.NET: Tell me a little about the adoption event on Saturday. Say someone is seriously interested in adopting, do they have paper work to fill out, are they going to be questioned, etc? Bean: We want the event to be super fun and welcoming to everyone. We have a straightforward and thorough application process. People are welcome to fill out an application before hand to see if they might be a good match. The online application is at stashok.com/adoption-application. Or they can fill an application out at the event. No household is perfect. We aren’t looking for perfection, just dedication, capacity, and love. Guys, how are you not misty-eyed right now? Also, we are taking donations for the Oklahoma City Pet Food Pantry. Isn’t it wonderful that such a thing exists? They help elderly and people who’ve hit hard times feed the furry members of their family. All cat food donations will help out volunteers who feed colonies of dumped cats at Lake Thunderbird. Bean: Well, there are the hard truths that no one wants to talk about: Oklahoma is one of the very worst states in the nation for puppy mills. 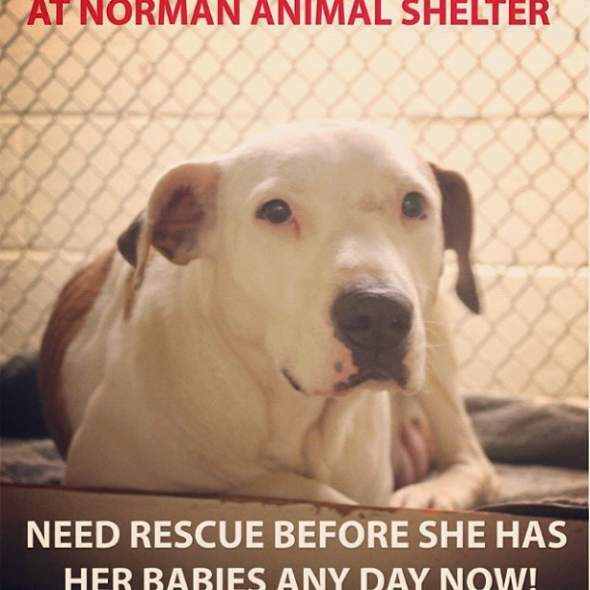 Last month the Oklahoma City Shelter euthanized 448 animals in the month of February. Over 200, 000 adoptable pets will be euthanized this year in Oklahoma alone. Millions every year in this nation. Every pet that is bought from a breeder, pet store, or out of the newspaper puts a needle in the arm of a shelter pet. It’s just that simple. The real key is to avoid pregnancies in the first place. There is no good excuse for breeding. It doesn’t fix the temperament of a dog, you can’t replicate the awesome parents (are you just like either of your parents? No.) There is NO GOOD REASON TO BREED OR BUY. We have to stop every litter possible. Puppies are amazing, but there is literally a rescue for every breed you could ever want, if a pure bred dog or a puppy is what’s important to you, I guarantee that with a little effort, you can find the dog of your dreams without supporting a breeder. I just hope that we’ve helped to spread the word to adopt/ spay / neuter/ rescue/ and to never buy from a breeder. Also, there’s no such thing as a bad breed. People who still think that pit bulls are in any way evil or untrustworthy are living in convenient fear and misinformation. The pack of chihuahuas I grew up with bit my friends numerous times over the years. It was terrible! They weren’t well trained at all. None of the pit bulls I’ve ever had would even consider biting a person. Historically, pit bulls were “nanny dogs” and war heroes. (think the RCA dog, Pete from the little rascals, WWII posters etc. ) We think momma dog is part pit bull, but aren’t certain. Anyone who has reservations about this breed should get to know one. Many friends who were formerly leery of pit bulls, because of their bad rap, have been completely won over by our adopted dog Juno (who is full blood pit bull). 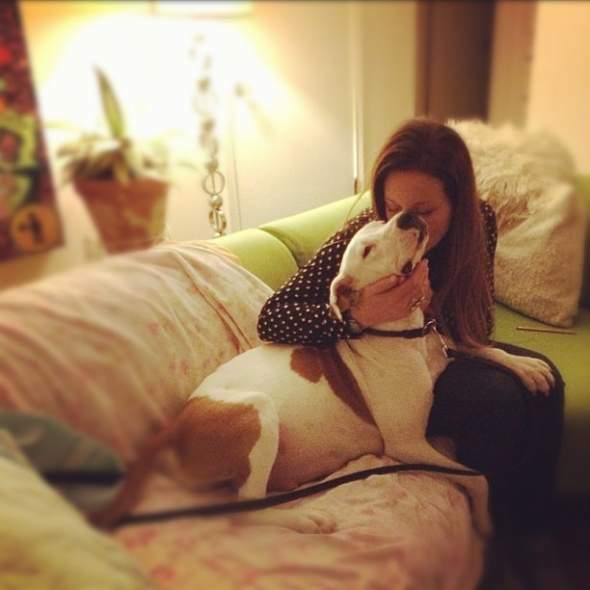 They often say that she is one of the most tender, empathic, and friendly dogs they’ve ever met. And she is not unique. What makes her special that she knows how lucky she is. There is nothing quite like the grateful heart of a rescue dog. Mama and one last little girl pup remain up for adoption. If you’re looking for a dog, consider filling out an application for one or both here: stashok.com/adoption-application. Tagged adoption, community, FOSTER, NEUTER, norman, Puppies, Rebecca Bean, Rescue, SPAY, STASH. Bookmark the permalink. This story has truly brought me to tears! I was one who also saw Mamacita’s plea for rescue! I tried to get ahold of everyone I could to try and get her to my home to foster her! I am currently working with Ruff Life Rescue based out of Wisconsin. And I emailed you today in regards to one of Mamacita’s puppies! Belinda from Friends of Norman contacted me about the “sip and see” on Saturday. But because I live in Washburn, Wi. I won’t be able to make it! We are very interested in adopting one of her babies. And I sure hope you received me email and we can here from you soon! I am currently fostering a Deaf Great Dane that is 1 1/2yrs old. She was being fostered in Oklahoma until we could get her transported here. Her owners from Texas literally starved her to death and they were going to shoot her! She only weighs 67lbs which is more then half of what she should weigh! She has been saverely beaten and mistreated. So trying to teach her sign language is very hard. Because every time you raise your hand she cowers in fear Of being hit! This is the one time in my life I wish dogs could really speak and she could really hear me so I can tell her that she is finally safe and very loved. And she will NEVER be hit or STARVED again! Non of my 3 dogs now have been from a breeder. They are all adopted and 2 from foster homes working with rescues! They are the loves of our life. They are treated NO different then our four boys! Sometimes I really want to put an add in the paper saying “Free to good home! Four boys that are always getting into things, very loud, they never listen my always do the opposite of what I say, I am always picking up after them and I just can’t take it anymore! They are just not working out in our home!”!!! I bet I would get a million responses if I put that in the paper! People need to realize that those cute little puppies need a ton of training, love, patience, food, time, vet visits and vet bills! And most importantly your life long devotion to them! Dogs and cats are no different then humans other then they have no voice! They need the same amount of love, food, encouragement, patience, time and most importantly you! To love them and train them and help mold them into the type of pet that you would like to have! Training doesn’t just happen in the snap of a finger! It takes a tons of time and repetition! They will learn everything you want them to do as long as you show them tons of love and have all the time to give them. And plenty of patience along the way! OWNING A PET IS A LIFETIME COMMITMENT!!! If you are not ready to take on a new baby. Then please do not take on a new puppy or pet period for that matter! And please to anyone reading this. Rebecca was right when she said that for every breeder out there having a liter of puppies is how many needles end up in poor helpless, lonely, scared, voiceless shelter dogs daily! So please, if you are looking to add a FUR-EVER loving to family member to your home. And take on the lifetime commitment and all that comes with owning a pet. Then PLEASE ADOPT DONT SHOP!!! I hope to hear from you soon Rebecca! And thank you so, so, so much for opening up your home and your heart for Mamcita and all of her babies! You are an angel on earth! 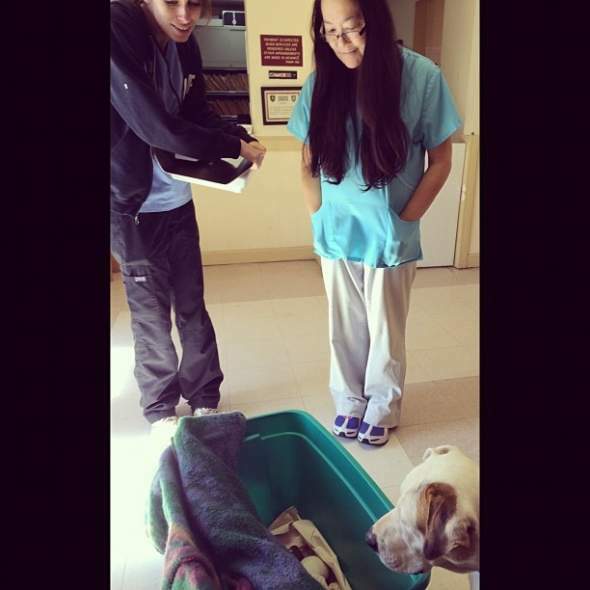 Rebecca and everyone else that has helped this momma dog are truly amazing people. I have thoroughly enjoyed watching the whole process. Good work! 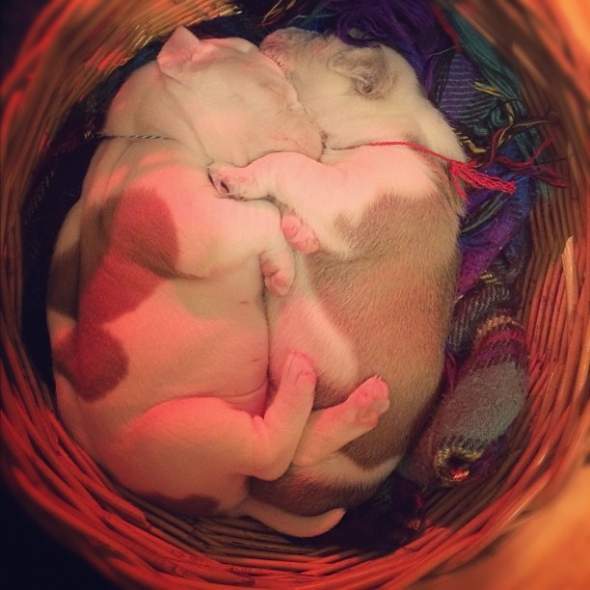 And CUUUUTE puppies. I wish you the best with the adoption event tomorrow.